During this week we have finished all the office work prior to the site visites. It has been very intense but we are very happy to be ready for the beginning of them! We have also experienced the Thiar festival in Bhimphedi and in Hetauda. It is the second largest Nepalese festival after Dashain. It is considered a very important festival as it shows a contribution not only to humans and gods, also to animals such as ravens, cows and dogs that have an intimate relationship with the animals and humans. They have filled the whole town with lights hanging in the beautiful houses! It has reminded us of our Christmas. Children go from home to home dancing and asking for money and food in return. We accompanied those of Balmandir who had prepared their performance and we had a great time! We also made a visit to Supping to plan the beginning of the works and the order that we will take according to the mistris that each family has managed. We already know that the first one to start will be Pradeep! This week has been very intense! The office work this week was focused on the video that Monica has been preparing for some time. With the three prototypes made by other volunteers in Bhimphedi (block, wood and stone with mud) we have marked in yellow the necessary triangulations for the stability required by the houses in anti-seismic constructions. These slides will be seen in the post production video and we hope that visually and quickly the need for their placement is understood. 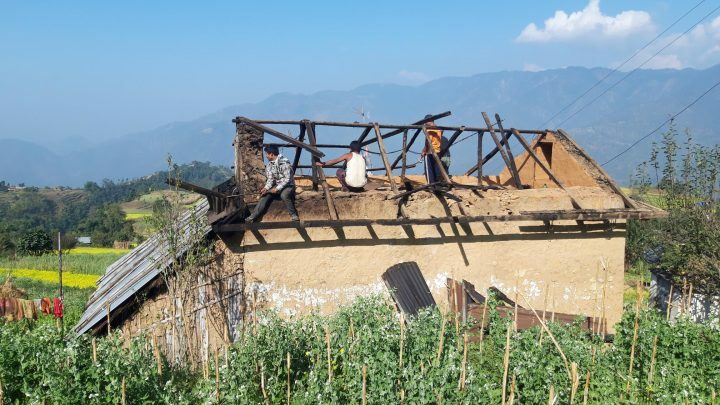 For three days we had to been divided, since the filming was in Bhimphedi with an audiovisual filming crew from Kathmandu and the works started in Suppin with roof demolion of Sanumaya Waiba house. The children of Balmandir have participated in the shooting and have been great, you’ll see! In Supping the demolition has gone very fast, we have already eliminated the slab of the second floor and part of the wall. We are very excited! The works have finally begun! 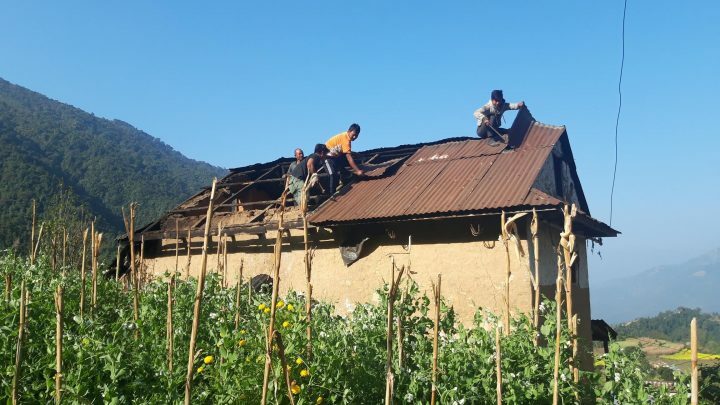 Throughout this week we have been going up in the mornings to Suppin to supervise the works of Sanumaya Waiba house, that his son and beneficiary is Pradeep. 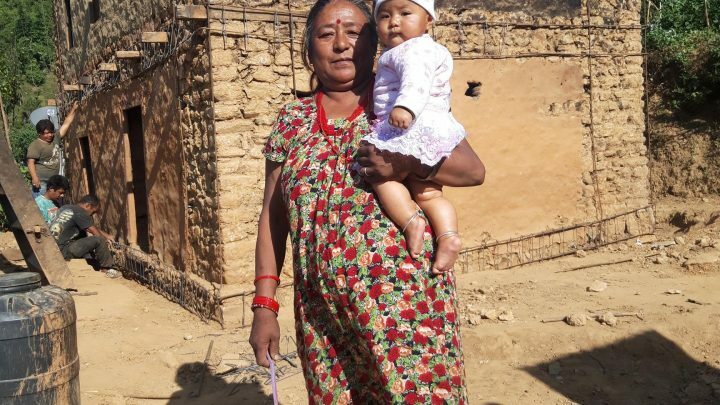 It is quite simple since he speaks very good English and we can communicate with him, although we are improving the Nepalese language so it is easier for us to understand each other with the rest of the family and friends! There are the corners and the entire sorroundings band excavated. We are already preparing the rods, stirrups and wires to place all the required assembly in the horizontal and vertical bands. They have also eliminated the dhunga mato from the first slab and olny the joists and beams are remaining. We have verified that there is no need to replace any of them in the first slab, since they are all in acceptable conditions. The mistris and us are very happy with the work done, since we are learning a lot from each other! Hopefully everything keeps going smoothly! We continue on Suppin! The works are going from strength to strength, since the assembly is already fully installed! 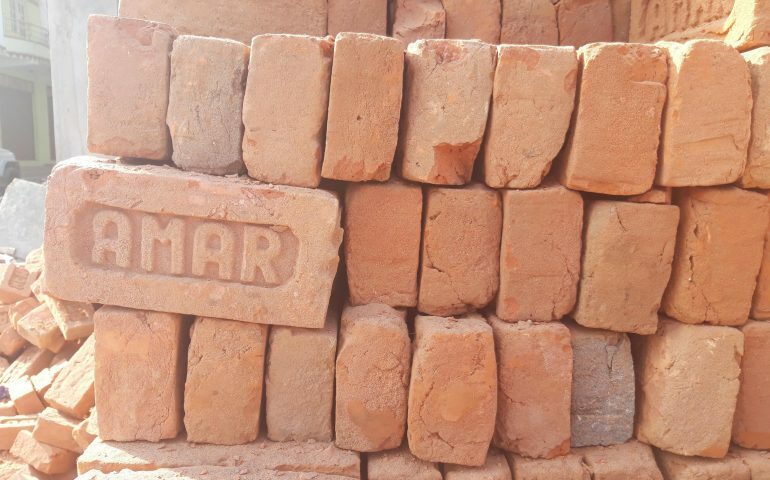 It has cost a lot of work and effort, since the surfaces are very irregular and there are areas in the stone walls that are very difficult to drill. 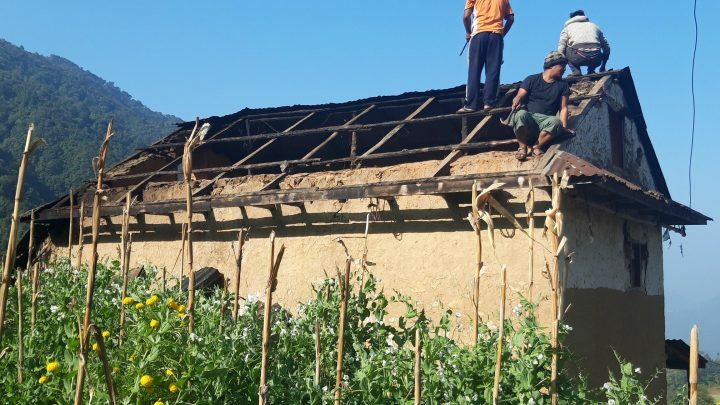 Also this week we have received the company responsible for fumigating the Dhunga Mato building that the old volunteers built, which is full of endings. We have encountered a serious problem, which is that in order to carry out the entire process they required water and there was no supply in the building. Thanks to Monish and the neighbors we got it! For two days, each neighbor contributed his grain of sand by leaving us a piece of pipe that we spliced until getting to deposit water in the work area from the nearest source (about 500m). Madeep, another neighbor, left us his house deposit to make the work faster and more efficient! All community work worth seeing, the truth! In Suppin they are about to concrete. We really want to see the first finished work and that we all like!